There are only six kilometres in the strait of Mytilene between Lesvos and the Ayvalik islands in Turkey. In the summer the deep blues of the eastern Aegean are complemented by a backdrop of lush green and yellow hills from the surrounding islands. In the winter the calm seas swell to short sharp waves as bitter winds batter the rocky beaches. This is a sight hundreds of thousands of people now know far too well. It is the scene of Europe’s largest mass migration since the Second World War. 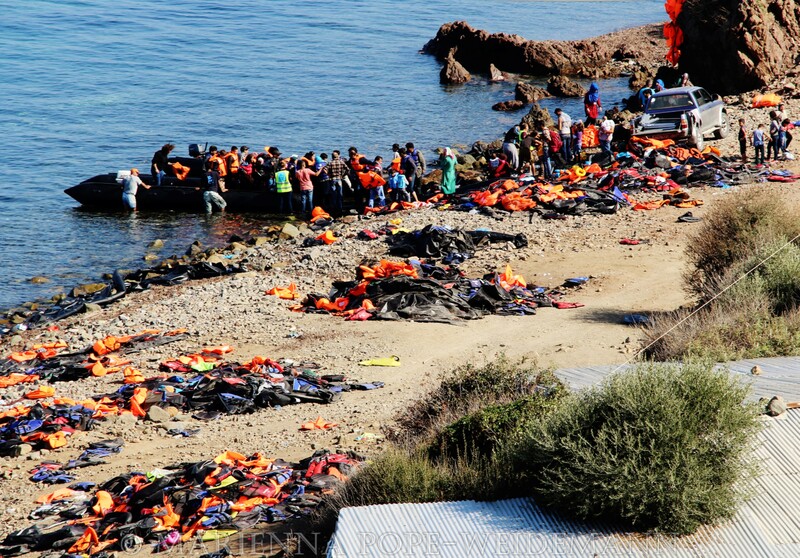 A boat arrives on Lesvos, October 2015. As various European politicians visited the refugee camps and saw the abandoned life jackets on Lesvos and Leros, Chios and Kos, they looked east for solutions. But as they glanced over the wintery waves and pictured the perilous journey which so many have now made, they should have thought through the viability and ethics of the deal they’ve just signed with Turkey. In exchange for 3 billion euros in humanitarian aid and visa free travel for Turkish citizens in the EU’s Schengen zone, Ankara agreed to take ‘back’ any future arrivals to Greece i.e. those refugees who make the treacherous journey across the Aegean after the signing of the deal. In return, for every individual sent from Greece to Turkey, a Syrian from the camps in Turkey will be sent to Europe. This will be the largest population exchange between Turkey and Europe since the 1920s when Greeks and Turks swapped whole communities following the end of the Ottoman Empire – an irony not lost to the elder generations. Never mind the human rights implications and clear violation of the Refugee Convention – this population swap just seems plain bizarre. It sends a message that the 17,000 desperate people who have drowned in the Med trying to reach Europe have died in vain. That Europe is not a welcoming place for those escaping violence and war. It says to all those who have risked it all, who have walked a thousand miles, that it’s time to go back to Turkey. Many of the refugees who have fled Turkey have left for a reason. They couldn’t find work, or they didn’t have the correct papers to be eligible to stay in a refugee camp. Or they were from a country where they are not deemed a refugee, such as the bastion of peace and prosperity that is Afghanistan. This ‘one in one out’ policy is an over simplistic reaction to a complex problem. It’s a solution built on the compromise between those European states who care little for the notion of solidarity, and those who are facing economic and political collapse. It’s a deal with an increasingly autocratic Turkey which has the upper hand. A Turkey which imprisons journalists, takes over newspapers and is falling deeper into internal conflicts and corruption. Turning a blind eye to what’s happening inside Turkey was to be expected. However, the appeasement of President Erdogan doesn’t stop at the Turkish borders. Germany is now allowing comedian Jan Boehmermann to be criminally prosecuted for having performed a satirical poem about Erdogan on TV. It’s not just questions about Turkey’s ability to guarantee the rights of refugees. Crisis-ridden Greece is also coming under fire for its handling of the post deal milieu. NGOs and aid agencies who have been providing the vital and lifesaving infrastructure and leg work in Greece on the ground would rather pull out of the field than become: “instrumentalised for a mass expulsion operation … that has no regard for the humanitarian or protection needs of asylum seekers and migrants.” The volunteers themselves who have contributed so much to helping fresh arrivals are deeply frustrated. The Papal visit to Lesvos last week garnered accusations of whitewashing by the Greek government. The much celebrated visit saw authorities remove tents and makeshift shelters, replacing them with containers, and giving refugees new clothes. There are also serious concerns from the Greek asylum service that they will be will be unable to process all the refugees currently residing there. Bottlenecks of refugees on the border with Macedonia at places such as Idomeni have emerged following the closure of the borders. Of course Turkey has already gone to monumental lengths to host refugees – with over 2 million Syrians living in camps in the southeast. But Europe is at risk of giving in to its own paranoia and pandering to the extreme right over this crisis, and in turn ignoring what its euros will be used for. This shocking video of the Turkish coastguard ramming a rubber boat full of refugees, a week after the Greek government, along with many others, designated Turkey a safe third country, is a reminder that we need to focus on the methods that will be used to “stem the flow” of refugees to Europe. While the Mytilene straight might become a lot quieter this summer following the deal, it won’t solve the refugee crisis. Nor will it stop other routes from opening up. Europeans must ask themselves if their governments are acting in a humanitarian fashion or merely saving face.